The Pantry Project oh my....... can we just say this was a project I thought would never get started and once started I didn't think it would ever get finished.... nuf said here is what happened. We had our kids coming last Christmas, (oh that would be 5 adult children and their spouses, and a total of 9 grandchildren under the age of 6 for a grand total of 19 extra people insert huge smile here) and I thought it was a wise idea to clean out the pantry, like empty the whole thing and get it organized since I knew with everyone coming the weekend before Christmas I would have lots of groceries to buy. So, I cleaned it out and upon doing so realized what a mess we had. This old house is old, old, old like it was built in 1899.. a zillion years ago . The back half which was added onto in the late 60's with a room in between an apartment which is my mother in laws quarters in the very back. The newer half needed a new roof for a few years before it was actually done two years ago and there was some water damage between Our kitchen and the addition which was in the pantry area. So back to my story about organizing for the Christmas Season.... Well when I emptied it out we realized just how bad the damage was and exactly where those stinking mice were coming into the house at. 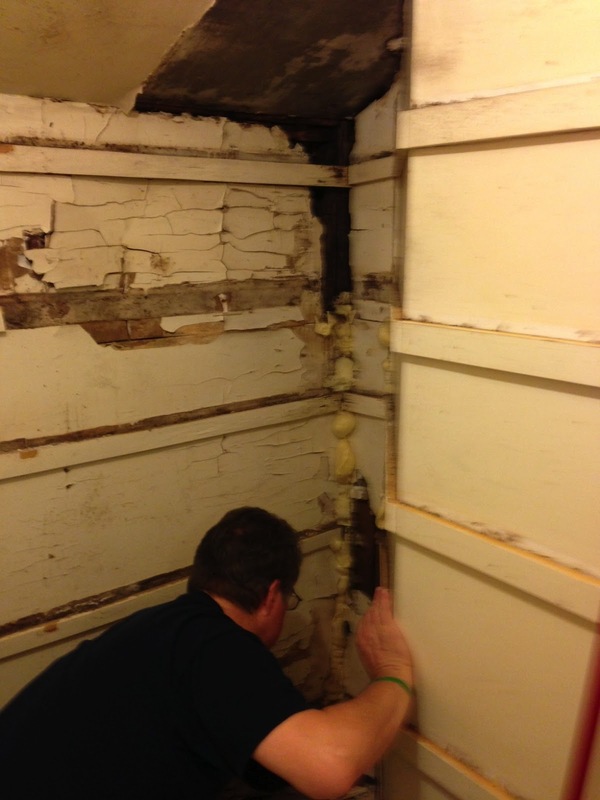 So realizing how bad it was and discovering the whole pantry needed to be gutted some of the joists replaced and the outside wall replaced, we decided it needed to wait for warmer weather. 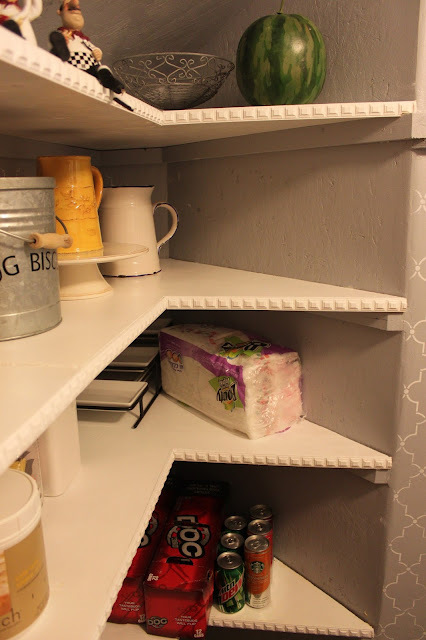 I had gotten along without this pantry for 7 1/2 months and FINALLY the walls were finished, I got them painted, the floor laid, bought a zillion containers and it is done, finished. I am sooooooo HAPPY! The one thing I do know, is that down the road when we build a new home, it WILL. HAVE. A. PANTRY!!!! IT MUST!!! So without further ado here is the before and after shots of our now awesome, beautiful, efficient, organized pantry!!!!! It is so cute I want to have a pantry party! We even had room in the corner to put a small fridge for those times which has been all summer that we needed extra room in the fridge! I have reorganized my kitchen cabinets since I was able to get all of this stuff out of my cupboards!!! And here is my Hubby working diligently trying to get this project finished..... Thank you Mark!!!! 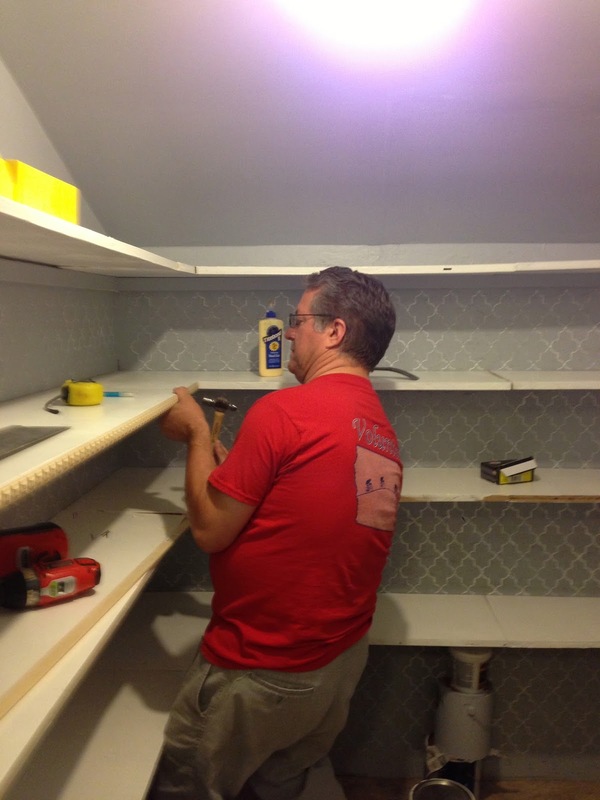 And Mark added trim to the edge of the shelves to give it that special "look"!!! I love it! As if organizing all of this wan't enough I got busy and made a "Grocery" sign! AND isn't this just the cutest? 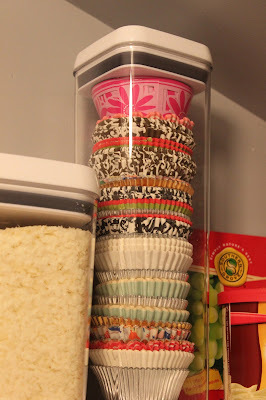 A canister just for cupcake papers!! 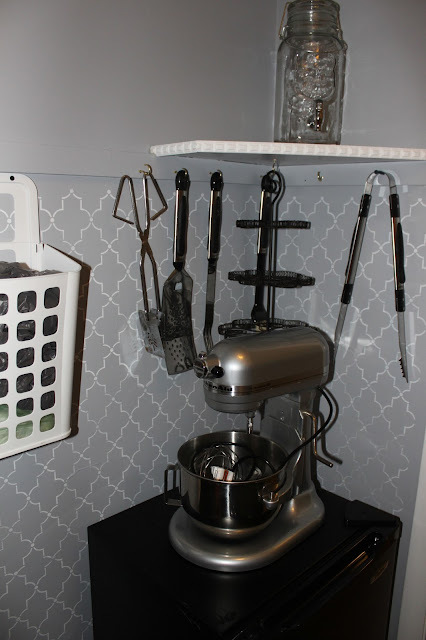 The Fridge top gave me a good place to store my mixer! 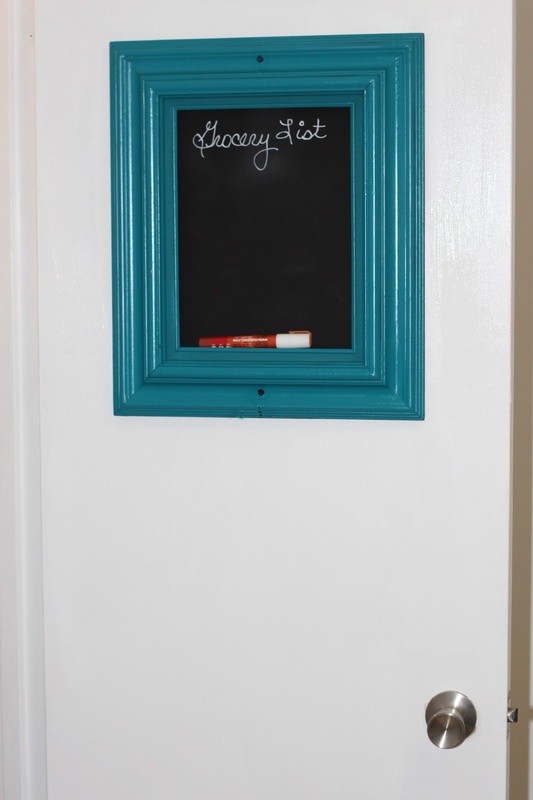 Here is the inside of the pantry door.... and yes those are screws you are seeing, but trust me they will be covered up and you will never see them! 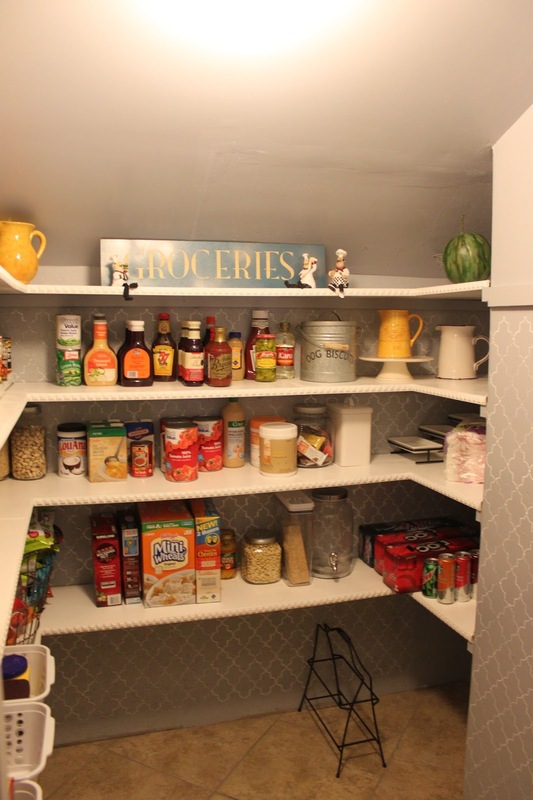 So there you have the newly renovated pantry! What a job it was and so glad it is finished!!! It is so nice to walk in there and find what I am looking for!! Talk about appreciating a "space" well this is appreciated!!!! Now that was some serious work that totally paid off. This post is so inspirational. I would love it if you would share this today at our WIW linky party. I hope you can join us! Thanks Paula! I will come check it out! 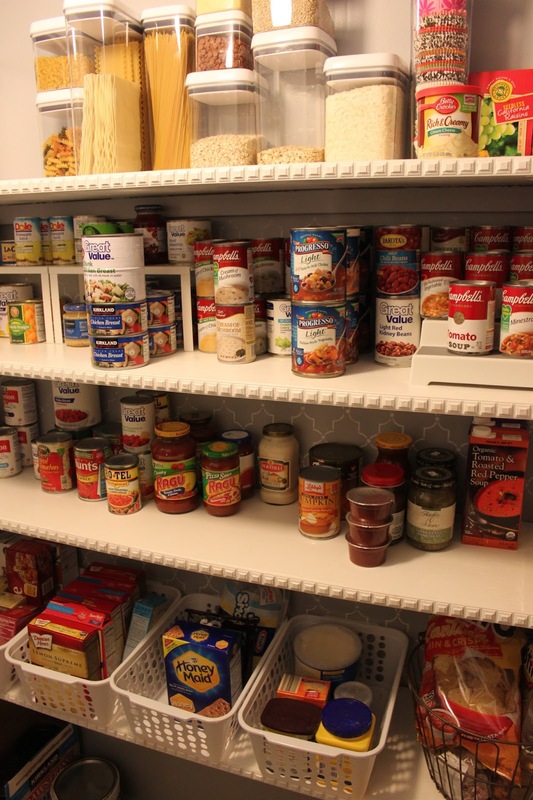 I am featuring your pantry on my blog today. You guys did a fantastic job. 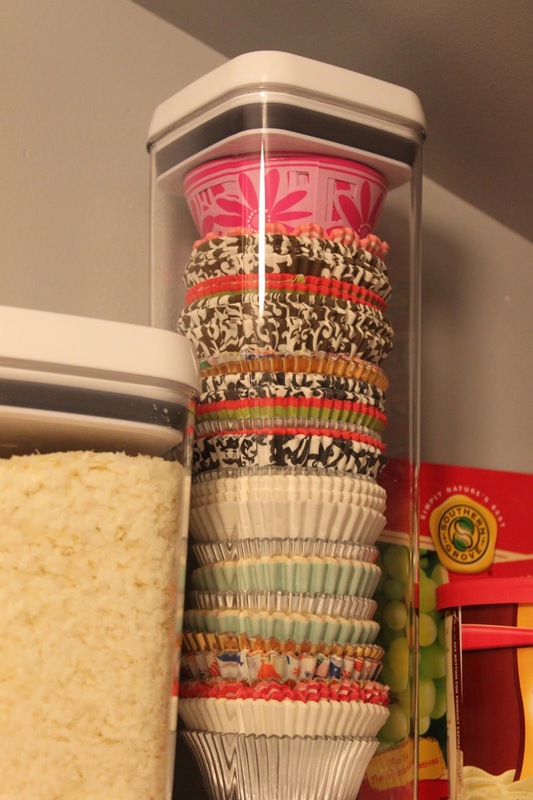 I love an organized pantry. Thanks for linking it up and I hope to see you tomorrow for another party.